When I am preparing a pie for someone I try to consider what their dietary restrictions might be. Sometimes I know that a person is gluten-intolerant or that they are a vegetarian. This information helps to guide my choice of pie (or quiche) and I do my best to meet or exceed their needs. Occasionally a person’s needs challenge me to create something that I have not made before. Such was the case today when I needed to make a pie that was both gluten and sugar free. It took a little bit of thought but this is how I went about it. 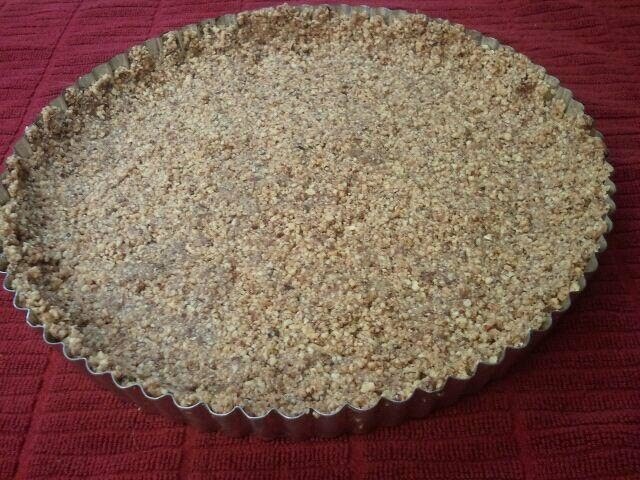 First I needed to make a crust without flour… and so I chose to grind up almonds and add a bit of butter and pressed that into my tart pan. Next, I added a mixture of cream cheese, egg, and apple juice concentrate to the crust. Finally, I arranged sliced apples on top of the cream cheese mixture. The apples had been tossed in a syrup made from apple juice concentrate and cornstarch. 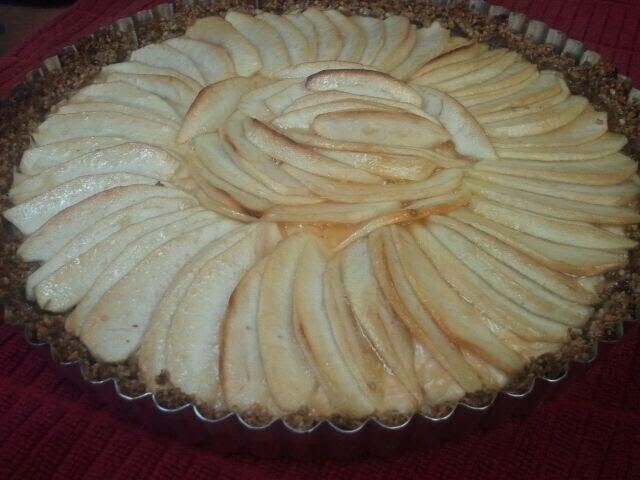 The tart baked for about 45 minutes and when it was done it had a lovely golden brown tint on the apples. It looked and smelled quite nice… if I do say so myself. Today’s pie was made for Amey, one of the department managers at the new Medford Food Coop. Amey was one of the first managers hired, and she has been an incredible asset to the Coop. I know I speak for everyone involved when I say that we are very lucky to have her on our team. Well Karen, this was absolutely scrumptious! 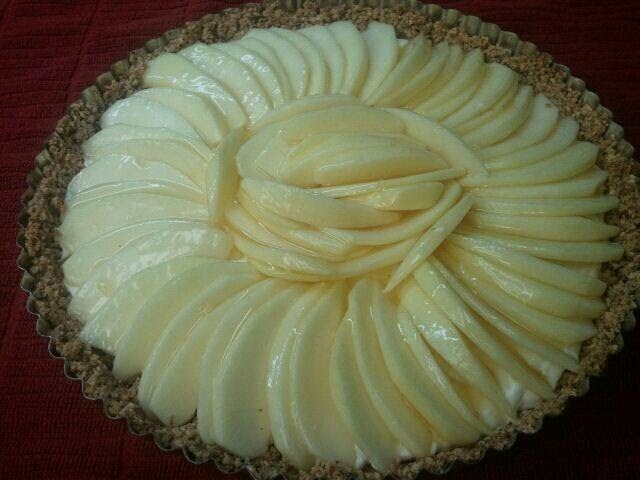 I think anyone would have found this tart to be thoroughly enjoyable, satisfying and a wonderful gift. I did not miss the gluten or the sugar. You arrived at our home around 10 am…your timing was just perfect as none of us had eaten breakfast yet. 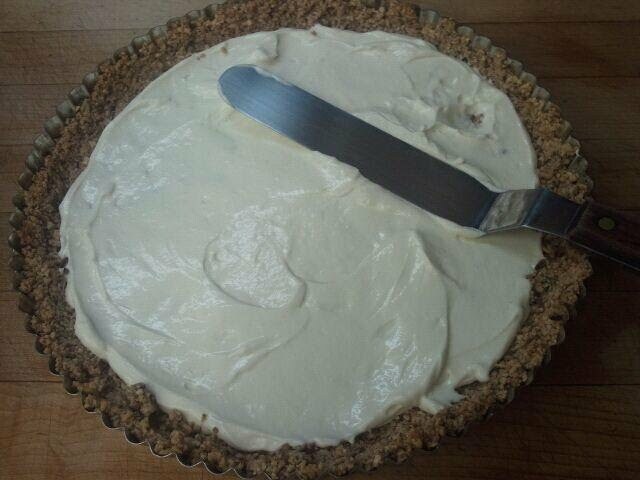 So while the tart was still slightly warm, we cut into it and just loved it! It was satisfyingly sweet, slightly tart and rich. I had a bit later in the day after it was cooled, and it was still just as delicious…maybe even better! We love your project and check on your pies regularly. I feel kindness is one of the most valuable resources we can share, sometimes touching people’s live in ways we may never know or understand. I am grateful for your abundance and generosity of kindness. Thank you for your heartfelt intention and practice. Thank you Amey… I am so glad that you liked it. One thing about this project is that I don’t know what the finished product tastes like (99% of the time) because I give the pie away. So, I appreciate knowing that it tasted good and appreciate your kinds words as well.